Grant having been placed in command of Western Tennessee, began preparations for opening a vigorous campaign. When he was ordered by Halleck to ascend the Tennessee River and establish himself somewhere near Corinth, on the line of the Memphis and Charleston Railroad, Grant obeyed, but made a personal trip up the Cumberland River to see General Buell, who had asked him to do so. It is now admitted that Halleck secretly feared Grant's popularity, and as human nature is the same all the world over, there were not wanting men who sought to fan this jealousy. 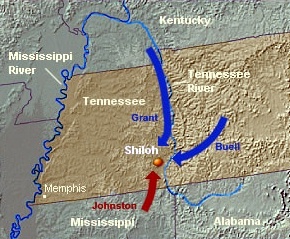 Owing to the non-delivery of Grant's letters, the passage of his troops up the Tennessee was not known at headquarters, but Grant's presence in Nashville was speedily reported. Halleck immediately telegraphed to Grant, asking why his orders were not obeyed regarding a report on the effective strength of his army, and directing him to turn over the command of the Tennessee movement to General C. F. Smith, and remain at Fort Henry. Stung by this treatment, Grant asked to relieved, but as Halleck soon discovered that he had gone too far, he restored Grant to his active command. That was the turning point in the career of the man who was eventually to rise to the command of all of the armies of the United States in the field. Referring to this critical condition of affairs, Sherman makes the following comments in his own memoirs: "By the end of February, 1862, Major-General Halleck commanded all the armies in the valley of the Mississippi, from his headquarters in St. Louis. These were, the Army of the Ohio, Major-General Buell, in Kentucky; the Army of the Tennessee, Major-General Grant, at Forts Henry and Donelson; the Army of the Mississippi, Major-General Pope; and that of General S. R. Curtis, in Southwest Missouri. He posted his chief of staff, General Cullum, at Cairo, and me at Paducah, chiefly to expedite and facilitate the important operations then in progress up the Tennessee and Cumberland Rivers. On the 21st; General Grant sent General Smith with his division to Clarksville, fifty miles above Donelson, toward Nashville, and on the 27th went himself to Nashville to meet and confer with General Buell, but returned to Donelson the next day. Meantime, General Halleck, at St. Louis, must have felt that his armies were getting away from him, and began to send dispatches to me at Paducah, to be forwarded by boat, or by a rickety telegraph line up to Fort Henry, which lay entirely in a hostile country, and was consequently always out of repair." After quoting the dispatch relieving Grant, which passed through Sherman's hands over the "rickety telegraph line," the old hero says, very quaintly: "Halleck was evidently working himself into a passion, but he was too far from the seat of war to make due allowance for the actual state of facts. General Grant had done so much, that General Halleck should have been patient. Meantime, at Paducah, I was busy sending boats in every direction--some under the orders of General Halleck, others of General Cullum; others for General Grant, and still others for General Buell at Nashville." On assuming command, Grant found no reason for changing the disposition of the Federal troops, even had he the time. Sherman was covering all the main roads leading to Pittsburg Landing, but there were dangerous gaps in his line, so Lew Wallace was sent to Crump's Landing, Hurlbut to the left of the Corinth road, McClernand and Prentiss being in the advance. Grant's entire force amounted to thirty-three thousand men, and as Buell, after repeated solicitations had received Halleck's permission to join Grant, the entire Army of the Ohio, forty thousand strong was already marching from Nashville. Everything pointed to an important battle, for Beauregard was concentrating his troops at Corinth. Bragg came up from Pensacola, Polk from the Mississippi and Johnston brought his whole army from Murfreesboro, so that the Confederates had forty-five thousand men on the ground, with Van Dorn and Price, who had been driven out of Arkansas by Curtis and Sigel, coming up with thirty thousand more. Albert Sidney Johnston, being senior in rank, assumed command of the Confederate army, and there was a council of war, when it was decided not to wait for Price and Van Dorn, but attack Grant before Buell could join him. On April 4, both Wallace and Sherman found Confederate forces on their front, but none of the Federal Generals had any definite idea how many men Johnston had under him. There was a heavy rain during the night of the 5th, but the sun rose bright and clear the following (Sunday) morning. Spring had now so advanced in that region, that the woods wore a soft mantle of green, while the perfumes of field and forest filled the balmy air. Nature was in her calmest, sweetest mood, yet armed men were marshalling for deadly combat amidst these signs of the approaching season for tillage and sowing. There was indeed some deadly sowing to be done among these overflowing creeks, but Death was to be the grim harvester. Beauregard, who had planned the Confederate movement, was so confident of success that when the conference ended he shook his scabbarded sword with one hand, as he pointed to the distant Federal camps with the other saying dramatically, "Gentlemen, we sleep in the enemy's camp to-morrow night." He got the camps but did not sleep. In the light of subsequent information there is but little doubt that had Beauregard been able to retain the chief command at the very beginning, the Battle of Shiloh would have had a different ending than the one history now gives it. The Confederate advance was extraordinarily swift and silent, for the soaked ground gave back no sound as the leading columns pushed through the woods. So sudden and unexpected was their descent that the Federal pickets were swept aside, and before Sherman knew what had happened Hardee was pounding him and Prentiss. Almost in an instant the battle had begun, there was no overture to the performance, for serious work was on hand from start to finish. Grant had gone to Savannah to see Buell, who was expected, but when he heard the distant guns, Grant hastened back, reaching the field at eight o'clock. By that time the Confederates were moving round Sherman's rear, while Prentiss lost his camp. Seeing his danger, Sherman swung round, and taking new ground held it during the day, despite all efforts to dislodge him. Sherman's troops were raw in the experience of war, but he managed to hold them together in the face of a most deadly series of musketry volleys, for the Confederates fought desperately. It was a scene for a painter. The sun shone hotly over fields and woods, the atmosphere was filled with dense volumes of smoke, which writhed and rolled under the constant concussion of thousands of muskets. The awful yell of the Southerners pierced the ear, while shot and shell crashed among the trees amid which Sherman's troops had sought temporary shelter. Still they held to their position, although ammunition was running short. "Can you hold your line?" wrote Grant to Sherman. "Yes, I can, if you will send me powder and ball cartridge, and be damned quick about it," replied the impetuous brigade commander. Grant took the hint, and as Sherman's men filled their pouches they gritted their teeth, and with blackened faces bit their cartridges and went to work in returning bullet for bullet. Then ensued a fierce musketry duel, the air was filled with whistling missiles, and the Confederate advance was checked. Sherman was twice wounded, in the hand and shoulder, and a third bullet passed through his hat. He also had several horses shot from under him during the day. Again and again did the Confederates charge, but Sherman's line could not be shaken. The Thirteenth and Fortieth Missouri especially distinguishing themselves. So the tide of battle ebbed and flowed, all of the other brigades finding it difficult to withstand the repeated rushes of the Confederates, who fought like demons. Cannon and musket, shell and bullet, did its deadly work, and the soddened earth was carpeted by dead and dying men, with the bright sun shining in full refulgence over the ghastly and repulsive scene. Matters were now assuming a serious aspect for the Federals. By noon the Confederates had taken the ground occupied in the morning, and captured the camps of McClernand, Sherman, Prentiss and Stewart. In fact, three of the five Federal divisions had been completely routed, Hurlburt alone holding to his original position. General W. H. L. Wallace was killed, and the rear was thronged with fugitives from the raw regiments which had never before seen a battle of an kind. It was a moment of terrible suspense for Grant, for he found himself driven into a corner on the bank of the river, without any signs of Lew Wallace's five thousand men, who had been ordered up from Crump's Landing, neither had he heard from Buell. But the idomitable character of the man carried him through the emergency, and he fought on, the idea of surrendering never entering his mind. The success attained by the Confederates had, however, cost them dearly, for two of their Generals--Hindman and Gladdon--had been killed, while Johnston had left the field field with a wound which subsequently proved fatal. Beauregard, being now in command, decided to seize Pittsburg Landing, and all his energy was directed in that direction. But his men came to a deep ravine, at the mouth of which the gunboats Lexington and Tyler were posted, while on the opposite crest the Federals had hastily assembled twenty or thirty cannon. The Confederates bravely plunged into the ravine, led by such officers as Pond, Stuart, Ruggles, Chalmers, Stevens, Cheatham and Withers. But the soft earth had been soaked by the recent rains, and the men floundered in the deep mud. Colonel Webster, of Grant's staff, who had assembled the guns, then saw his opportunity, for he opened on the Confederate front with his hurriedly collected artillery, while the gunboats swept the ravine with eight-inch shells. Finding themselves in a trap, Beauregard's men here showed wonderful courage, for they charged the Federal batteries again and again, only to be cut down in broad swathes, for the Federal infantry was now rallying and delivering a deadly musketry fire. The scene at this point was a terrible one, the ground being thickly covered with dead, dying and wounded men, while the smoke from cannon and musket concealed the combatants from each other. Finally Beauregard decided to pause, thinking that he could finish Grant on the following morning with the greatest ease. As the Confederates fell back, Lew Wallace joined Grant, he having taken the wrong road, and Buell's advance under General Nelson was also on the field. Exhausted as were the Federals, these reinforcements gave them fresh hope and courage. The sufferings of his troops during the night after the first day's battle is described by Grant in the following language:--"During the night rain fell in torrents, and our troops were exposed to the storm without shelter. I made my headquarters under a tree, a few hundred yards back from the river bank. My ankle was so much swollen from the fall of my horse, the Friday night preceding, and the bruise was so painful, that I could get no rest. The drenching rain would have precluded the possibility of sleep without this additional cause. Sometime after midnight, growing restive under the storm and the continuous pain, I moved back to the log house under the bank. This had been taken as a hospital, and all night wounded men were being brought in, their wounds dressed, a leg or an arm amputated as the case might require, and everything being done to save life or alleviate suffering. The sight was more unendurable than encountering the enemy's fire, and I returned to my tree in the rain." During the night of April 6, twenty-seven thousand men were added to the strength of the Federal Army. Grant had personally superintended the disposition of his several divisions, and as Buell had brought up his own divisions under Nelson, McCook and Crittenden, he was assigned to the left and centre of the new line of battle. It had been arranged that the fresh troops were to begin, and Wallace's artillery opened at dawn as the Confederate left was attacked and driven back. Nelson and Crittenden were likewise engaged on Grant's left, finding the enemy in very strong force, because Beauregard had retained his purpose of capturing Pittsburg Landing. The fighting now grew desperate, for the entire line had become engaged, the Federal artillery fire proving too much for the Confederates to stand before. Hazen's brigade had charged upon and captured one of Beauregard's batteries, turning the guns against him, while McCook's division came up with Terrill's battery, and pounded the Confederate centre with ten-pound shells and twelve-pound canister. Then came the turning event of the day. Mention has been made of the little log church which has given this battle its Federal name--for the Confederates only recognize the engagement as that of Pittsburg Landing. It was at the church that the final effort was made. Sherman had joined Wallace, and both Generals pressed steadily forward until they at length reached the ridge Sherman had occupied on the previous morning. Beauregard, finding his path to the Landing so stubbornly disputed, countermarched and formed in front of Grant's right, finding himself again out-generaled. The fierce tide of battle now surged to and fro, as Beauregard, heroically endeavored to carry out his original plans, while Grant as stubbornly held to his own. Round the church the carnage was dreadful. Little did those humble Methodists imagine when they built their log structure, that one day it would be the centre of a horrible battle, that its logs would be splintered by countless leaden bullets, and torn by solid shot, or exploding shell. They had used it for a place of prayer; these opposing armies now in deadly combat, held it as their common rallying point. The sound of song and praise to the Creator had given place to the roar of battle, the yells and cheers of advancing battalions, the agonized cries of shattered and wounded men, the deafening detonations of artillery, and the angry crash of musketry. Seldom has such a scene of carnage been enacted round the spot dedicated to divine worship. The church was taken and retaken a dozen times, each charge adding to the heap of dead or dying combatants. There was no opportunity for succoring those who had fallen, and many a Federal and Confederate soldier received a second and fatal wound, as he lay helpless on the bloody earth. The trees that surrounded the log church were riddled by leaden balls, and they, too, were added to the dead, for nearly all withered under the terrible force that tore them into splinters. The Demon of War swept over the gory field. With one despairing effort Beauregard gathered his force together and made a headlong, furious charge, but it was of no avail, the battle was ended, and the Confederates began retreating. The cost of this victory for the Federals was, indeed, a heavy one, as there were no less than seventeen hundred men killed, seven thousand four hundred and ninety-five wounded, and three thousand and twenty-two taken prisoners, an aggregate of twelve thousand two hundred and seventeen. Buell lost over twenty-one hundred, Grant ten thousand and fifty. Beauregard's loss was ten thousand, six hundred and ninety-nine. In writing about the battle in after years, Sherman says:--"Probably no single battle of the war gave rise to such wild and damaging reports. It was publicly asserted at the North that our army was taken completely by surprise; that the rebels caught us in our tents; bayoneted the men in their beds; that General Grant was drunk; that Buell's opportune arrival saved the Army of the Tennessee from utter annihilation, etc. These reports were in a measure sustained by the published opinions of Generals Buell, Nelson and others, who had reached the steamboat landing from the east, just before nightfall of the 6th, when there was a large crowd of frightened, stampeded men, who clamored and declared that our army was all destroyed and beaten." General Halleck rose to the sublimity of the occasion, and forgetting his pique at being compelled to remain at St. Louis while his subordinates were winning laurels in the field, he issued an order thanking Generals Grant and Buell, their officers and men, for the bravery and endurance shown on April 6, and the heroic manner in which they had, on the following day, defeated and routed the Confederate army. It may be mentioned here that Grant's detractors frequently brought the charge of drunkenness against him. One day it was repeated to President Lincoln, who quietly inquired of the speaker, if he knew what brand of whisky Grant was in the habit of drinking. Being answered in the negative, Lincoln expressed regret, saying it might be a good plan to serve the same brand to some of the other Federal Generals. Beauregard retreated to Corinth in excellent order, under circumstances of great hardship. He had only one road, encumbered with wagons filled with wounded men, whose sufferings were increased by the heavy storms of wind and rain, hundreds dying en route. Being situated at the junction of the Memphis and Charleston Railroad and the Mobile and Ohio line, Beauregard decided that he must make a stand at Corinth, so began fortifying. In the meantime Brigadier-General Mitchell, acting under orders issued by Buell before he started to join Grant, had cut the Memphis and Charleston road at Huntsville, capturing an immense quantity of rolling stock. He also seized Decatur and Tuscumbia, thereby opening up another hundred miles of the Tennessee River, for which gallant service Congress rewarded him with a commission of Major-General. Sherman had also destroyed the railroad bridge at Bear Creek. These operations rendered Corinth of no value in a strategic sense, but Beauregard clung to it. Halleck now made up his mind to have some share of the glory Grant was reaping, so proceeded to Pittsburg Landing, arriving there April 12, when he assumed personal command of what was then called "The Grand Army of the Tennessee." Scarcely had Halleck appeared, than Grant had found himself nominally second in command, but in reality having no authority, or any real duty to perform. But Halleck, in St. Louis, calmly criticising battles as he sat in his office chair, and Halleck in the field, were two different persons. It should be remembered that this really talented man had no practical experience in the art of war. He had been a military professor, and a successful one, but, while he could detect mistakes when viewing a campaign at a distance, he was unable to grasp its salient points nearer at hand. Deciding to move on Corinth, Halleck proceeded so cautiously that the Confederates were able to gather up sixty-five thousand men. That the approaching engagement would be a heavy one was considered evident, as Halleck had brought up Pope and some of Curtis' troops, his total strength being one hundred thousand men. The Federal army was organized in three grand divisions, the old army that had fought so nobly under Grant, forming the right wing, under command of General George H. Thomas; the Army of the Ohio, under Buell, being the centre, while Pope's Army of the Mississippi occupied the left. Grant had a general supervision of the right wing. Nine days after taking command, Halleck began his movement, but it was not until May 3 that Sherman, who had the advance, reached within six miles of Beauregard's advanced posts. Considerable fighting ensued, and on May 28 the Federals were only thirteen hundred yards from the Confederate breastworks, when heavy siege guns were placed in position and reconnaissances made on either flank. The following day, Pope and Sherman pushed forward more guns. Halleck now awaited results with calm confidence. He hoped for battle, and expected victory, and the capture of the greater part of Beauregard's army. Early the following morning, as the Federal skirmishers were seeking Confederate heads to shoot at, there was an awful and tremendous explosion, for Beauregard had departed, bag and baggage, during the night, leaving a few men to destroy the enormous quantity of ammunition he was compelled to leave behind. Thus ended the brief siege of Corinth, and Halleck reaped but a barren victory. It was now his turn to be criticised, and Halleck did not at all relish the experience. Few men do. Brave Beauregard also fell into trouble, for Jefferson Davis was wild with rage when he retired for a brief rest, and ordered Bragg to take permanent command, saying that Beauregard would never be trusted again. Some difference between Bull Run and Corinth. At the one Beauregard was a hero, the other brought him temporary disgrace.